I have played exactly nine hundred and ninety-nine games of Heroes of the Storm, and I’ve never seen a Murky player use the frog creature’s egg quite like this. Murky, for those who don’t know, is unique sort of MOBA character because of the way his egg works. 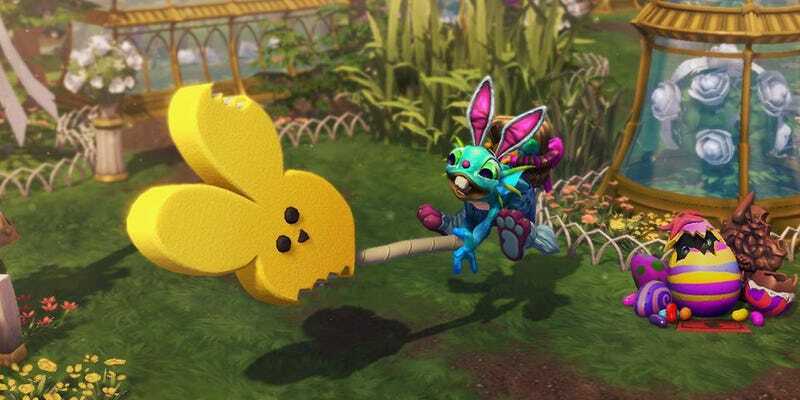 As Will Reilley explained on Kotaku, the egg is essentially a portable respawn location that Murky can install in strategic locations on a map. When an egg is active, Murky’s respawn times are cut down to two or three seconds—which is very handy, since he has almost no hitpoints and is very easy to kill. This combination of egg-and-low-H means that no matter how many times you kill him, he always comes back. Always. When Murky’s opponent sees an egg or finds Murky when his egg isn’t active, then, he or she will often do crazy things just to try and put the annoying little fucker to sleep for more than three seconds. Let’s slow this down and walk through what he’s doing step-by-step. I’m definitely gonna try this the next time I’m playing with four other friends; seems like the kind of thing that would require a great deal of communication and teamwork.